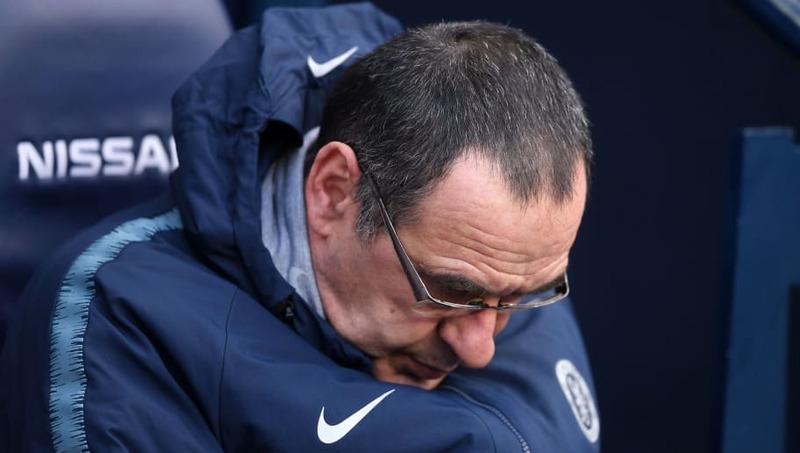 ​Speculation regarding Maurizio Sarri's future has inevitably intensified following Chelsea's embarrassing 6-0 defeat at the hands of Manchester City on Sunday. Roman Abramovich was a man suddenly in the spotlight, and the Russian has shown in the past that he doesn't require a second invitation to send his head coach packing. The bigger worry for Sarri is that Sunday's shambolic display wasn't the first time his side have been embarrassed on the road. This season the ​Blues were humbled 4-0 at ​Bournemouth and were completely overrun in the 2-0 loss against Arsenal. In seasons gone by, these type of performances have seen Abramovich pull the trigger. Many fans would have gone to bed on Sunday night not knowing if the controversial Italian would still be in charge come the morning, but it appears Sarri's tenure may still have time to run, for now at least. There is no hiding from the fact that Chelsea's displays in recent weeks - apart from the win over ​Huddersfield - have been unacceptable. However, there is a defence for Sarri to continue in his role despite the ongoing furore from the Stamford Bridge faithful. Sarri only took charge of the London side on July 14 2018, just under seven months ago. Now, let's not forget what the Italian has achieved in such little time, whilst also trying to implement an unseen philosophy to the Chelsea squad, Jorginho aside. It's hardly all doom and gloom, is it? Just look at Pep Guardiola when he took charge of ​Manchester City, people up and down the country were suggesting the ex-​Barcelona coach had been 'found out' during his first season in English football, but has since gone on to create arguably the greatest side the Premier League has ever seen. Jurgen Klopp has started to get ​Liverpool firing, but has been in the job since 2015. He has been afforded the time to implement his 'heavy metal' style of football, with the Reds now reaping the rewards for their patience with the German by mounting a serious challenge for the Premier League title. Both of those managerial philosophies, Guardiola's and Klopp's, draw similarities with the so-called 'Sarri ball' - a high-intensity pressing game, involving lightning quick counter-attacks and sumptuous offensive play which is hugely entertaining for all to watch. Now, Sarri is yet to consistently, or even largely manufacture that at Stamford Bridge, but just look at his ​Napoli side last season. Arguably the most watchable side in Europe and one that Guardiola described as 'incredible' following their Champions League encounter, all made possible because he was afforded three years in the job. The Italian has shown at Napoli that he is capable of delivering, so surely he has to be given the chance to do so? Isn't that why he was appointed in the first place? Following Antonio Conte's second-season debacle, marred by player revolts and fan displeasure at what was perceived as 'boring football', the controversial but electric Sarri was brought in to provide the Blues' fans with entertainment. The Chelsea faithful have been entertained to an extent and should not allow recent events to completely overshadow a season that has provided some encouraging signs. Sarri's side have toppled Man City, ​Arsenal, Liverpool and ​Tottenham across all competitions - showing they can mix it with some of the best sides in Europe, all whilst his philosophy continues to be implemented. So Chelsea fans, relax. Sarri hasn't turned into a poor coach overnight, given time and money he is capable of turning things around.